When a child is diagnosed with cancer, families are not only affected emotionally, but financially as well. They struggle to pay for hospitalization and treatment necessities while trying to cope up with the emotional turmoil. The disease does not only affect and changes child’s life, but also poses challenges to parents, relatives and even some friends to cope with this life threatening illness. The family process is definitely affected including their coping mechanisms. This is so true for Therese Faye Macabbabad’s case, a little girl suffering with Relapsed Clear Cell Sarcoma of the kidney. As a nurse working in the Pediatric Intensive Care Unit (PICU), I’ve seen several cases and most of them are admitted to PICU post operatively or whenever their condition deteriorates– requiring intensive medical and nursing care and close monitoring of hematologic and cardiopulmonary status. A few weeks ago, I have received a message from a friend informing me that he’s planning for an activity– a shoot for a cause, to help his friends. It never crossed my mind that he was referring to the parents of Therese. I ‘ve seen them once while they were taking care of Therese in PICU. I was on duty on that particular night but I was not the assigned nurse for Therese. The realization sinked in when I saw these images on my FB wall, tagged by sir Michael. 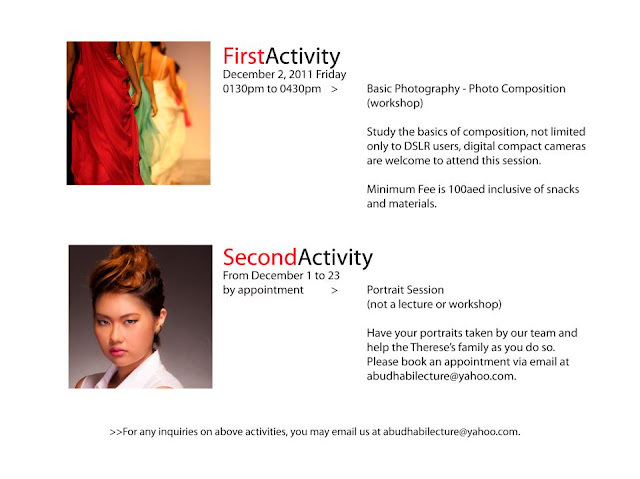 The shoot for a cause didn’t materialize; instead, these two activities were planned and posted. An hour ago, I’ve learned from my friend that Therese is readmitted in the hospital for another cycle of chemotherapy. As a compatriot and as a nurse, I wanted to help Therese but my capacity to do so is very limited. This post was written to encourage the people to help and support the said activities for the benefit of Therese. For those who wants to share their blessing and help Therese, you may click this LINK and look for the Donate Button posted below. 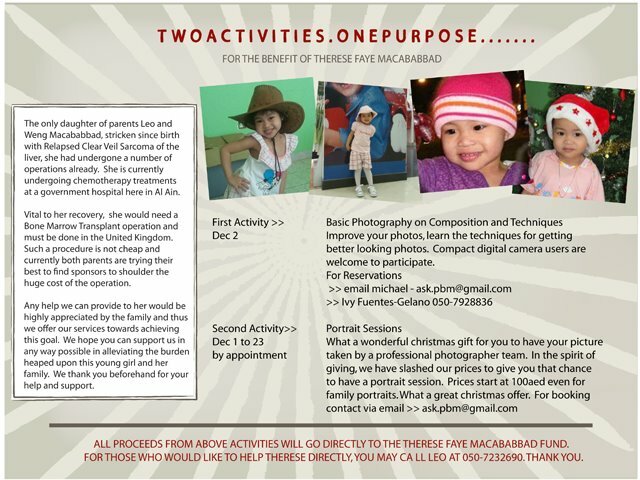 All donations will be given to the family of Therese. From the bottom of my heart, I want to thank you in advance for helping Therese and her family. Shukran and God bless you for your kindness. Thank you so much for posting master CM. Hopefully maka-generate ng funds na makakatulong kay Therese. Sabi nga nila, maliit man pero pag naipon malaking bagay na rin ang magagawa.